I can't believe that it's Monday again! I've had such a busy few days and it's all been yarn-related - I've felt very spoilt! On Thursday I went to the Sirdar mill in Wakefield. It was the visit that was part of the Knit Now Online Knitter of the Year award, along with the award presentations and a chance to catch up with the winners of the other categories. What a great day it was! We toured the mill from top to bottom (actually, from bottom to top but you know what I mean! ), saw more yarn than you could shake a stick at and even got a sneak preview of brand new yarns and design ideas. I've taken lots of notes and lots of pictures so that I can show you the whole process of how the yarn gets from the mill to your yarn shop, and how the patterns that you buy are created. We also got the inside view on how a magazine issue is created from Kate, the editor of Knit Now, and it's fascinating to see just how much is involved. I left Wakefield to drive to Skipton to collect a friend of mine and we headed up to Cockermouth to Woolfest. Neither of us have ever been before and as it's held in an auction mart just like Yarndale, we were interested to see what it would be like. It's bigger than Yarndale and there are more stalls and the layout is different, but the event feels similar and some of the stallholders also exhibit at Yarndale. 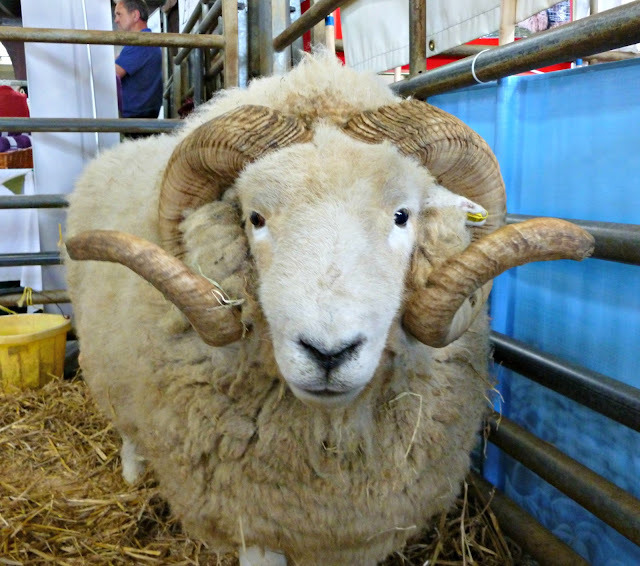 There is a lot more livestock at Woolfest - I've taken far too many pictures of sheep (if that's really possible!) - and we had a lovely time mooching and browsing and squishing. I didn't go mad, but I've come home with a few skeins of gorgeous squishiness. I do have a plan for them so there was no random splurging, but there very easily could have been! Big daughter leaves for Peru next Monday. We've been planning this for so long that it feels a bit unreal to be counting down the last week before she goes. We got all of her kit out last night to check that we had everything and we've still got a bit to get, so this week is last-minute shopping, dental appointments and catching up with friends before she leaves. There's not much more to get, though, and if you're thinking that there doesn't look like much to take for a month then I'd be inclined to agree with you. Her rucksack weighs 9.5kg at the moment - I think that's the lightest she's ever travelled! You might notice a certain pair of socks on the clothes pile to the right of the picture ... the second pair is almost finished - I've just turned the heel on the second sock so there's not far to go now but there's going to be some frantic knitting going on this week to make sure that it's ready in time. I can't have her hopping around the Andes! 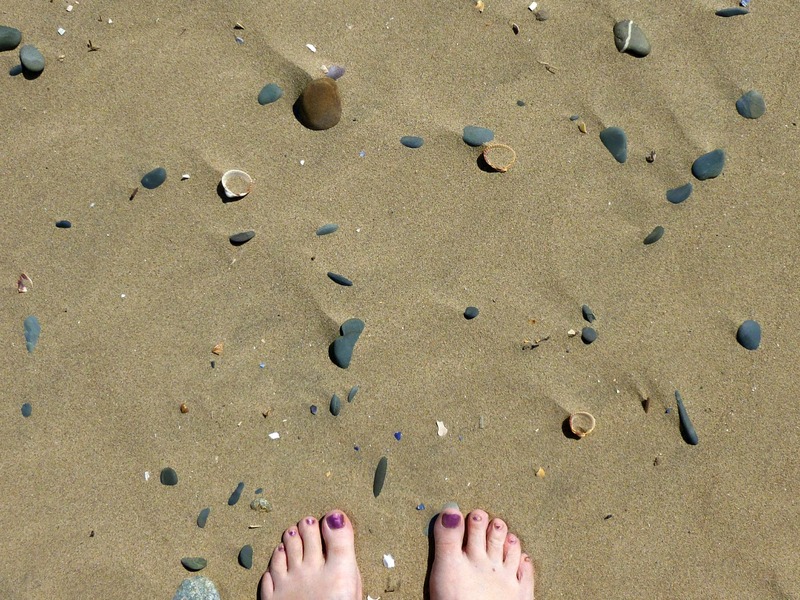 So, as you can see, there's lots coming up on the blog over the next few posts, but I hope you will forgive me if I don't write them quite as quickly as I might usually do. You'll get my undivided attention again next week and I'll probably be glad of you being around as it will take my mind off my girl being 6,000 miles away! With big daughter's Peru trip just under 2 weeks away now, we've been away this weekend to spend a bit of time together as a family without the usual hustle and bustle of routine life before she goes. 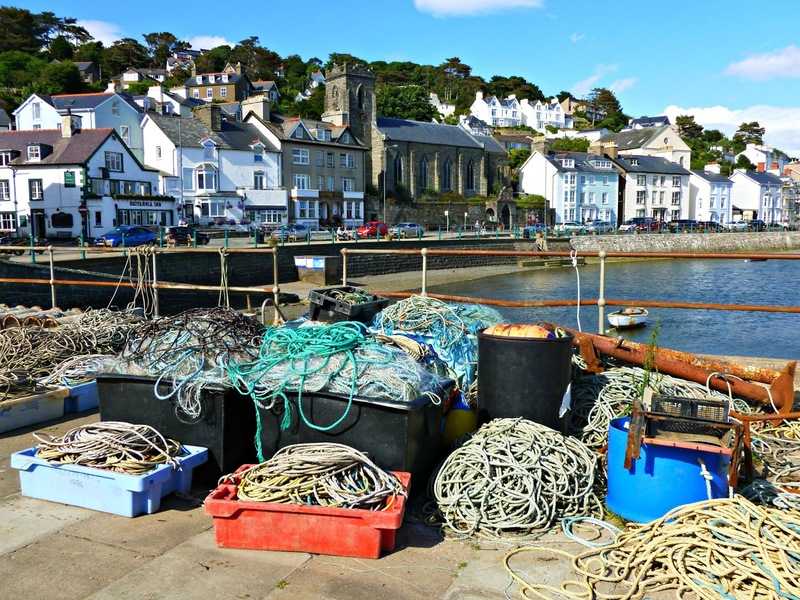 We went to mid-Wales, a bit further than our usual favourite places in north Wales, and stayed in a small village called Pennal which is between the seaside village of Aberdyfi and the ancient capital of Wales, Machynlleth. 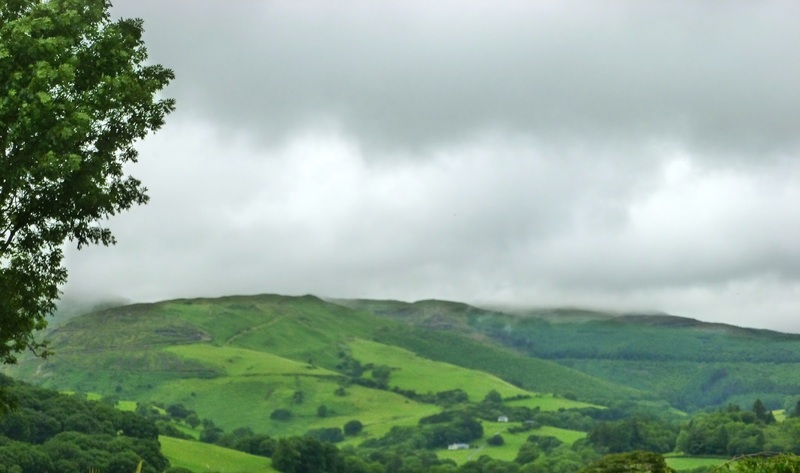 It's part of the Snowdonia National Park, and the huge hills that we drove between to reach our holiday home are very green and beautiful. Even in the rain (which it did for half the time we were there), you can see how bright and lush the hills are - fabulous! 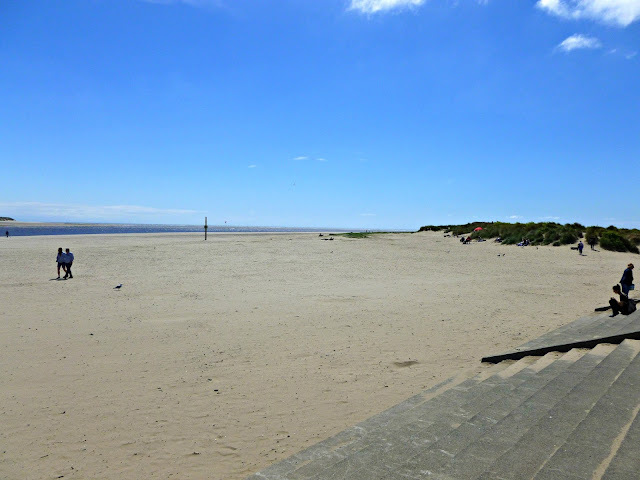 The rest of the time, the sun shone for us. 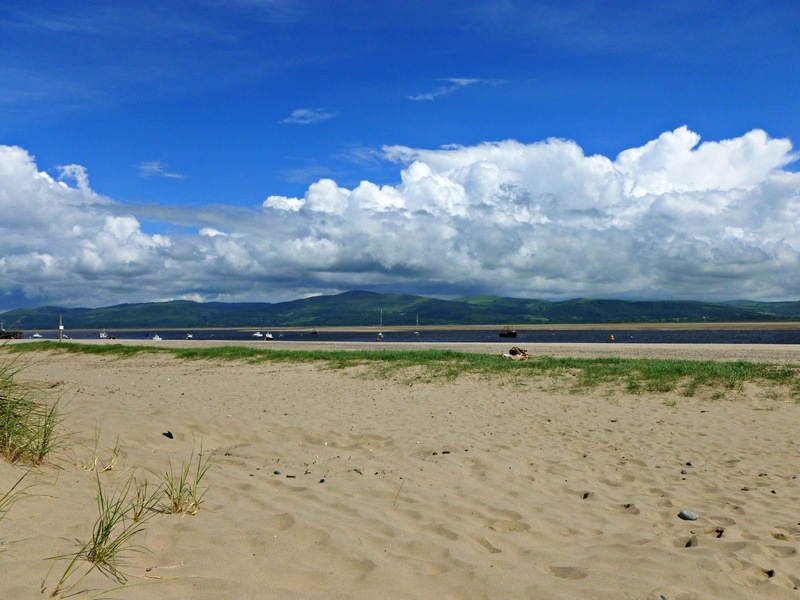 We headed to Aberdyfi and strolled on the beach - there's nothing quite like the sand between your toes on a sunny day! Aberdyfi is a lovely place with a long beach that stretches out into the distance. Small daughter had her shoes off and was off across the sand before you could say "Jack Robinson", leaving the rest of us to follow at a rather more sedate pace. 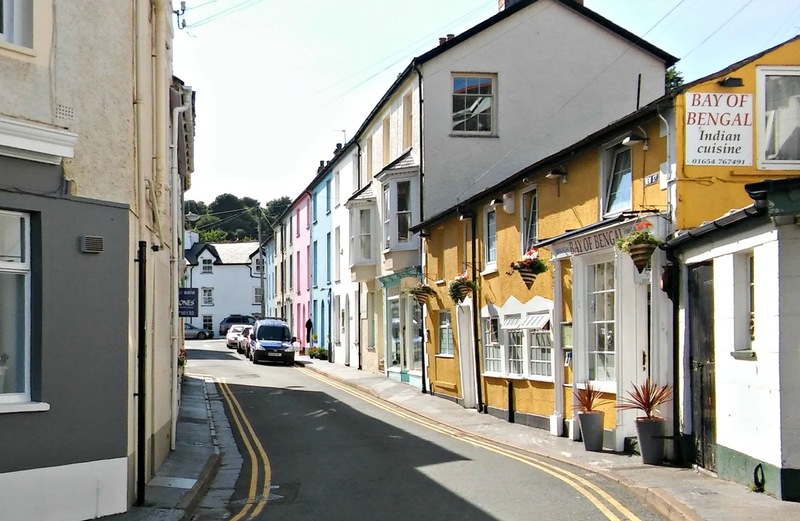 and looking back towards the village, the brightly coloured shops and houses stood out against the green backdrop. 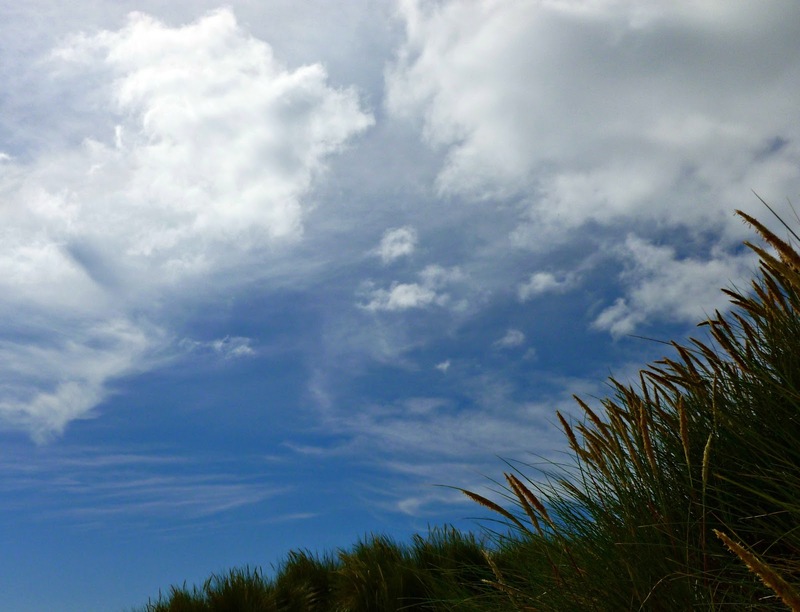 We found ourselves a space in the shelter of the dunes whilst small daughter persuaded my husband to go paddling with her, having discovered that the sand was too soft for sandcastles. Neither of my girls even bat an eye now when my knitting comes out (just as well, as these are big daughter's Peru socks still on the needles!) and it was nice to take a few minutes in the sunshine before small daughter came hurtling back. We walked back along the beach in search of ice cream, taking our time to walk along the railings to watch a boy catching crabs (he put them all back in the water) and look at the piles of fishing paraphernalia. There's something very seasidey about fishing nets and ropes, isn't there? 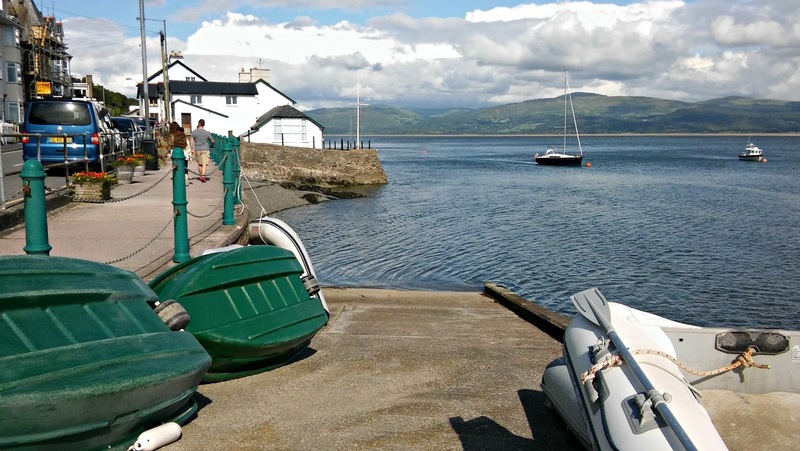 My husband and I have often talked about how nice it would be to be able to sail your own little boat around the coves of Britain, but neither of us have ever sailed (learning to canoe in the local swimming baths isn't quite the same!) and for now it's staying on our to-do list. 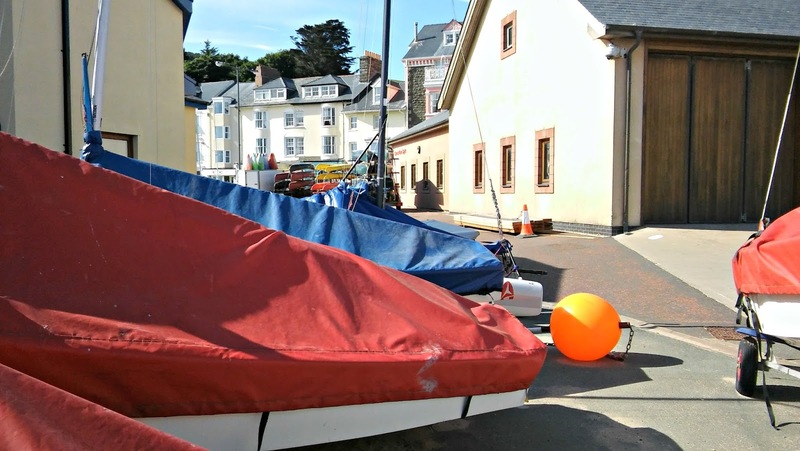 We do like to look at the boats as we pass though, and there's something about that sound that boats make too - you know, the one where the sail ropes clinks against the mast (I'm sure there's a technical term for that but you'll have to forgive me no knowing it). We love it! and finding more streets with painted houses. Such a pretty place, we were sorry to have to make our way back to the car to leave. Back at our holiday home, small daughter wanted to head for more water, but this time it was the pool. She wanted to try out her mermaid tail! This is what she chose to buy herself with some birthday money from earlier in the year. I must confess that I did try to dissuade her when she was browsing online, but once she had bought it and tried it out in the water, I was converted. She had a wonderful time being a mermaid, and could really zoom about once she got the hang of how to use her fin. She had great fun! The other place that we were close to was Machynlleth. Big daughter needed to revise (last A level exam this week - hooray!) and small daughter took the opportunity to stay with her so my husband and I went on our own to explore the town. 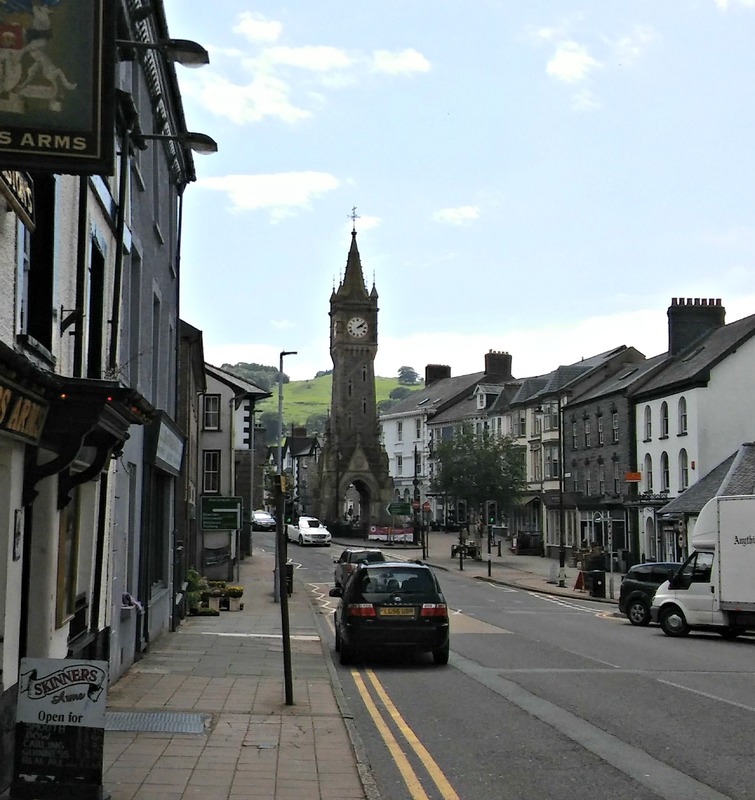 Machynlleth was the seat of Owain Glyndŵr's Welsh Parliament in 1404. Owain Glyndŵr was a Welsh prince who led a rebellion against the English during the reign of Henry IV, but the rebellion failed and he went into hiding. There are several buildings which relate to the time; if we had been there for longer it would have been interesting to visit. 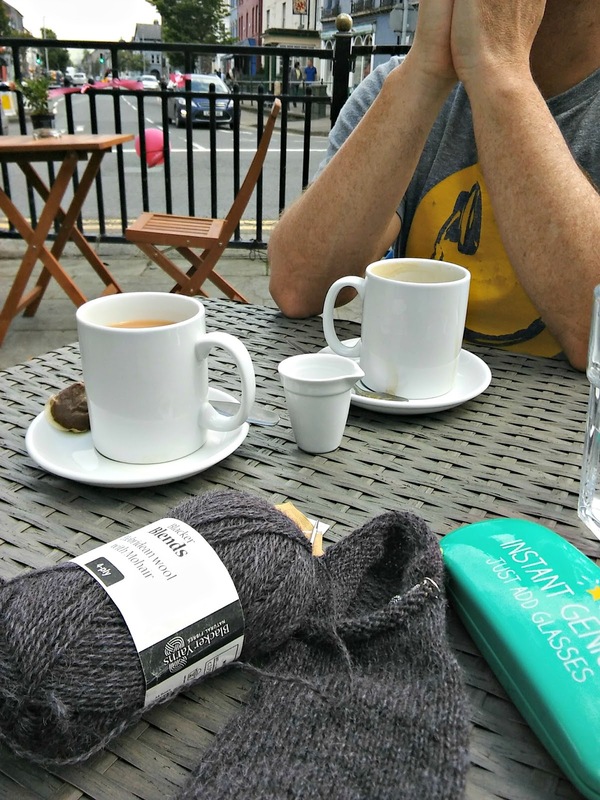 We found a cafe next to the clock tower and took the opportunity to have a brew, just the two of us. It doesn't happen very often! It was also World Wide Knit in Public Day so out came the socks J. The first pair of Peru socks are finished now, thank goodness - I was starting to worry that with all the adjustments I needed to make that big daughter would have gone and come back before I finished them! I got plenty of knitting done over the weekend, so the first sock of the second pair is nearly finished and I have just under two weeks to complete the second. It might take a couple of late nights to fit it all in with everything else that's going on, but I'll do it! I'm really very pleased with how these socks have turned out. The yarn is a very natural purple colour and I like that. 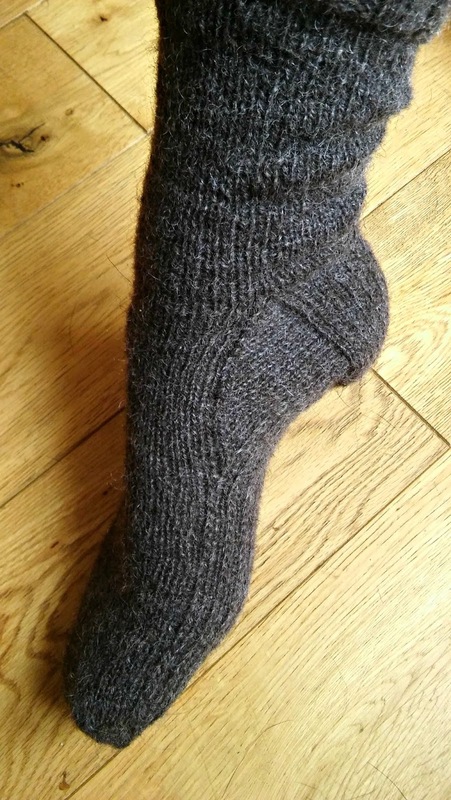 It isn't as soft as with other sock yarns that I've used, and it does have a distinctive woolliness to it that won't suit some people at all, but they are good solid socks and I am hoping that they will protect big daughter's feet very well. She's pleased with them too, which is a Very Good Thing seeing as she's going to be the one wearing them. I've reinforced the heels, soles and toes with heel stitch and I'll show you how to do that with your own socks in another tutorial (after the 8ply DK socks, I promise!). Big daughter can feel the difference on her feet and I'm keeping my fingers crossed that it will help to stop blisters which are not fun when you have a lot of walking to do. We did see a flock of chocolate brown sheep as we drove through Wales, more noticeable because every other sheep that we saw was white, and for a moment I wondered if they were the sheep whose wool I was knitting. Probably not, but wouldn't it be funny if they were? I've got an exciting day on Thursday because I'm off to the Sirdar mill in Yorkshire as part of the Knit Now Online Knitter of the Year Awards. There's a tour around the mill and a chance to meet up with the other winners which I'm looking forward to very much. I'll be sure to take lots of photos so that I can show you when I get back! I hope you have a lovely week, whatever you are doing! Don't you just dread the alarm going off on a back-to-school morning? I've been getting up at pretty much the same time over the holidays so it's not like it's a surprise, but this morning it felt like the middle of the night! Small daughter has had two weeks off school (unlike many schools around here) and she was not at all happy to put her school uniform on again this morning. It was raining as well, so although she didn't feel as if she was missing out on a sunny day, it meant that the dog and I were going to get very wet on our walk. It's what my Mum used to call "Jinny Greenteeth" when I was little, and always with a warning to stay well away or you'd be pulled into the water by something unpleasant. It worked for me - I always kept well clear and so did the dog, today. 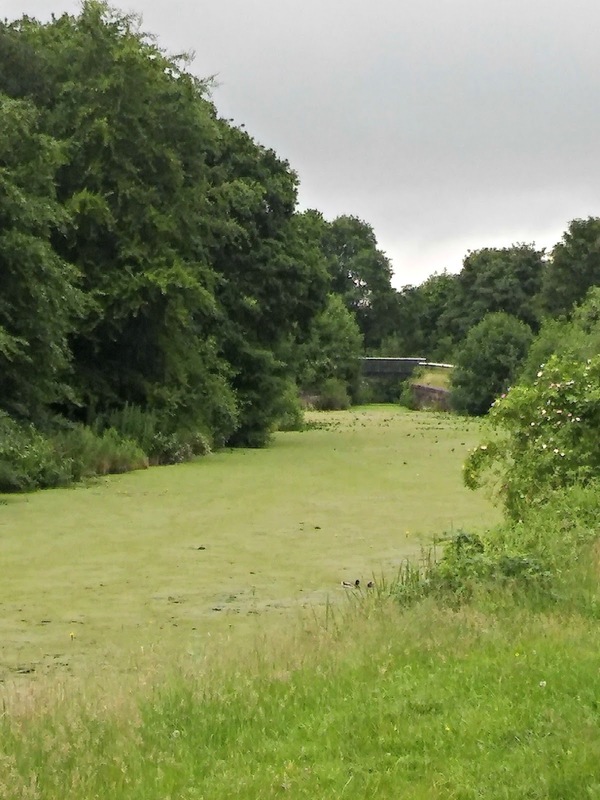 He's daft enough to have forgotten that it is water and have bounded onto it to follow the ducks leaving trails in the green so he was kept tight hold of until we were safely past. Apparently, Jinny Greenteeth has different names in different parts of the country so it's not just something that my Mum made up to control a small and exuberant daughter - you can read more about it here. Do you have anything like this where you live? Back on safe ground at home, the rain has been good for the plants that I brought back from my Dad's garden this week. His vegetable patch has been overtaken by foxgloves and poppies (and more than a few weeds - I really must spend more time there clearing up!) and although foxgloves and poppies don't usually like to be moved, they were so lovely that I decided I had to take the risk. 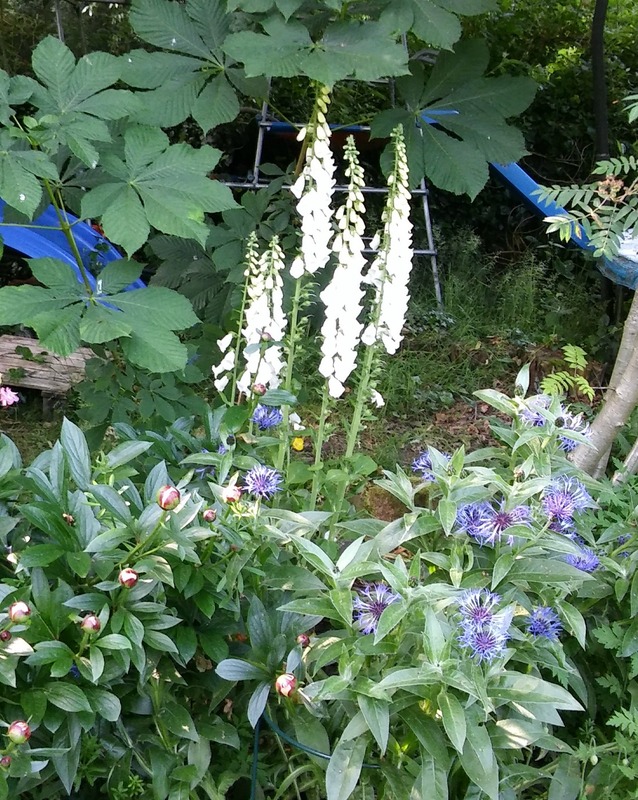 We do have a few white foxgloves in the garden but nothing to compare to these tall, stately spires. White flowers seem to glow in the twilight and these are just perfect at the end of the garden under the trees. They won't flower again next year as foxgloves are biennial plants which means that they grow in their first year and flower in their second year before dying off. However, I am hoping that they will produce seeds which will sow themselves around the borders. These are the poppies I brought back - you can see why I couldn't leave them, couldn't you? 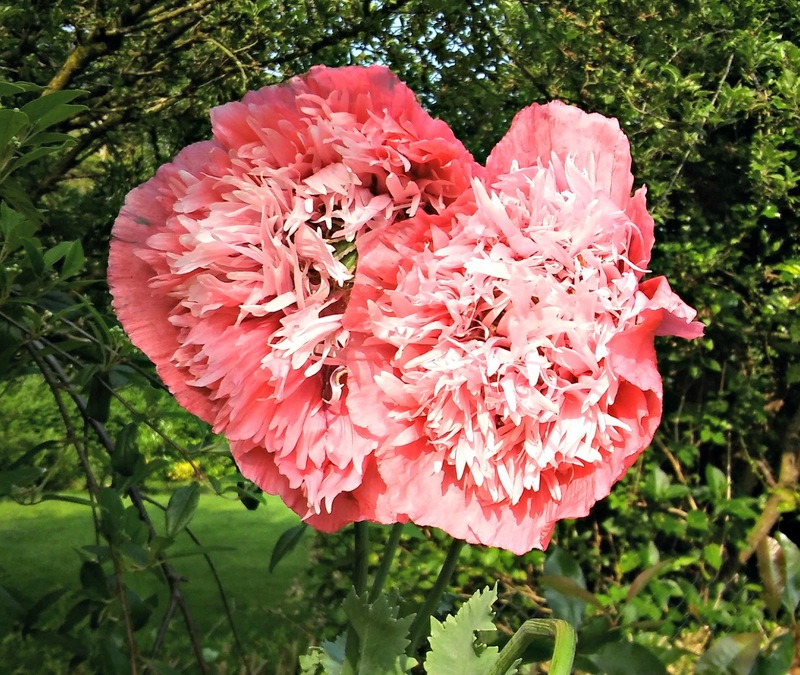 These are Papaver somniferum or opium poppies. These ones are annuals which means that they flower and die in the same year, but again I'm hoping that there will be seeds which will mean I get to see the flowers every year. We had visitors over the weekend so although that meant that the last few days of the holidays were a combination of cleaning, gardening and baking, it does mean that today I don't need to do any cleaning, gardening or baking - I can just eat the remains of the cake and get a few more rounds of the Peru socks done! I've been catching up on the podcast episodes of the debate programme In Our Time on Radio 4. Each debate is about an hour long and you need to listen to it to follow the thread of the conversation so usually I only get to listen to them on a train journey or at another time when I can sit and listen for an hour - I get cross if I have to keep jumping up and down to do things in the middle of the programme. My girls having a lie in over the holidays have provided the perfect opportunity for a cup of tea and some quiet listening! There are all kinds of subjects which are discussed by a panel of experts - history, science, philosophy, culture and religion - and of course with the on-demand service you can pick and choose what you want to listen to. This week I've listened to debates on the Salem Witch trials, Josephus (a Jewish historian from Roman times), Alexander the Great and the Greek historian Thucydides (whom I read about during my Master's degree). It doesn't take a rocket scientist to work out that my interest lies in the historical programmes, but there's such a wide choice that it would be hard not to find something to interest you! The first of the Peru socks is finally done - thank goodness! It's taken quite a bit of work to get it to fit to big daughter's exact specification and high instep but we've done it at last, and I'm very pleased with how it's turned out. The next three socks should knit up much quicker now that I know what I'm doing and how many rounds I need for each section. I was starting to worry that she'd have gone and come back before we got these socks right, but it feels like I should meet the deadline now! Phew! It does mean that I'll be knitting in every spare moment (it's not unheard of for me to get a few rounds in whilst standing in the playground waiting for small daughter to come out of school!) so if you see a mad knitting woman whilst you're out and about, you'll know it's me! There’s a prose poem by Joe Miller which starts “If the Earth were only a few feet in diameter …” and goes on to say how much better care we would take of it because we would see it as something special, rather than take it for granted because we live here. 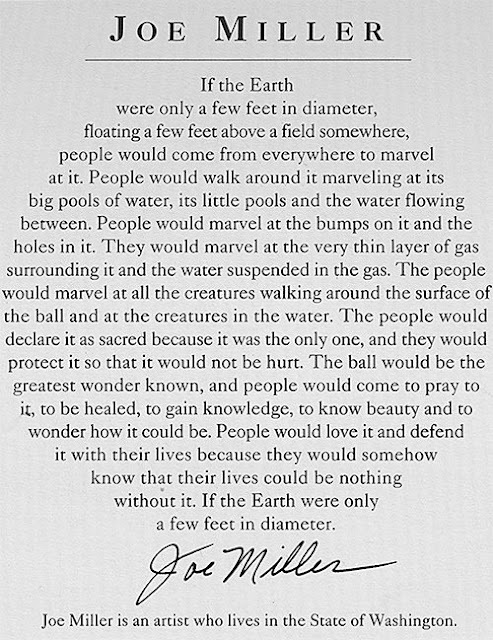 We would appreciate that delicate balance between the water and the land, at the creatures who live here, and how we would want to protect it because there is only one Earth. The poem came to mind because I’ve been looking at the photographs that Tim Peake, the British astronaut currently on the International Space Station, has been sending back to Earth through social media. Every day, there are pictures of a different part of our world. Sometimes it’s a country looking like a picture in an atlas, and sometimes it’s a cloud formation or the Aurora Borealis. Sometimes it’s something incredible in the sea that you would only ever see from space, and it makes me grateful that we are able to share in the views that he has. The International Space Station travels at around 17,150 mph so that’s a lot of views of the Earth! However, down here, we can only see as far as the immediate view lets us. We can’t see past houses or trees, and sometimes we travel so fast in trains, buses and cars that we aren’t really looking around us at all. We forget that we’re living somewhere that is special and where our actions have consequences that affect us all. Some people say that climate change would have happened whether humans were here or not and it’s just how the world is, but I believe that even if that’s true, we still have a duty to behave respectfully towards the Earth whilst we’re here. If we live on a planet where we are able to see the sun shine through the leaves, or the sea crash onto the sand, or any one of a million moments where nature is far more beautiful than anything we can create ourselves, shouldn’t we at least take a minute to acknowledge that? To breathe in the fresh air and take our rubbish home? The amount of rubbish I see when I’m walking the dog upsets me, and I quite often pick some of it up myself (especially if the dog looks like he’s going to eat it). Perhaps it’s just as well that the views from space are of the bigger picture, of our Earth as she is supposed to look, and not of the rubbish and the pollution that we are creating ourselves. 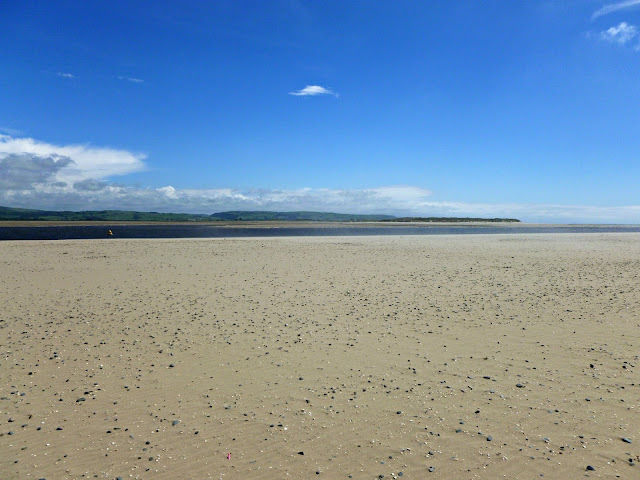 The prose poem finishes by saying that if we looked at our Earth in a different way, we would realise that our own lives could be nothing without it. It makes sense, don’t you think? No Earth, no us. Oh goodness me - something very exciting has happened! Wow! The British Knitting Awards are very prestigious industry awards, all nominated and voted for by the crafting community. This is a huge honour and it's all down to you for nominating me, so thank you! 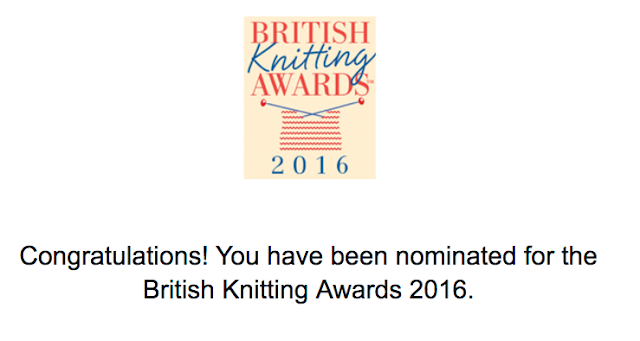 I've been nominated in two categories - Favourite book (2015) for Super Socks and Favourite knitting blog for Winwick Mum - and I'm one of five nominations in each category. I've kept looking at the list over the weekend to check that I'm not dreaming but no - it really is me there! What has stunned me is that my book and blog are alongside some really big names of the yarn industry - I still just think of myself as a Mum who knits socks! 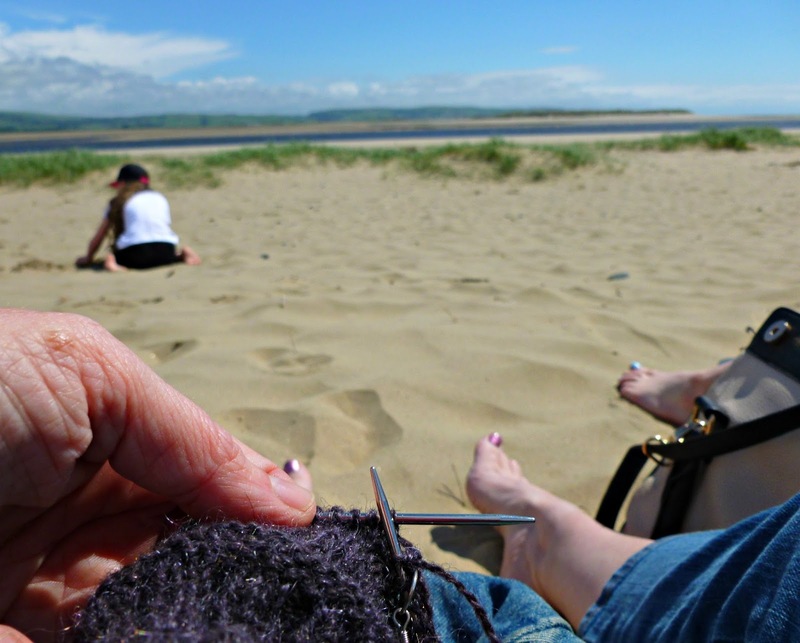 There are designers that I have known about for many years and whose patterns I have knitted, yarn manufacturers whose yarn has been turned into socks in my drawer, and alongside those some friends too. My lovely friend Lucy has been recognised in the crochet categories, and I'm very pleased to see my local yarn shop, Black Sheep Wools, is on the list in various categories too. What also delights me is to see other independent designers and dyers whom I have got to know through the Sockalong groups are also being recognised in the same categories as big manufacturers and online stores - not really a surprise as the awards are organised by Let's Knit magazine which also organises Yarn Shop Day and champions our local yarn shops and smaller independent yarn businesses - but good to see all the same. This really has been an incredible year for me, starting with the Knit Now Online Knitter of the Year Award (the visit to the Sirdar mill and awards ceremony is coming up soon so I'm looking forward to being able to share that with you) and now these nominations, not to mention appearing in more than once in magazines that I've been a subscriber to and now feature in! It's really wonderful, and I don't know if you can see my grin but it stretches from ear to ear - not least because I know that all of this will mean that more people will find the Sockalong tutorials and discover that there's a super-portable project that they can carry around to help them with their well-being and fill their sock drawers as well as quiet moments in the day. The voting for the British Knitting Awards has opened and will remain open until 28 August 2016. 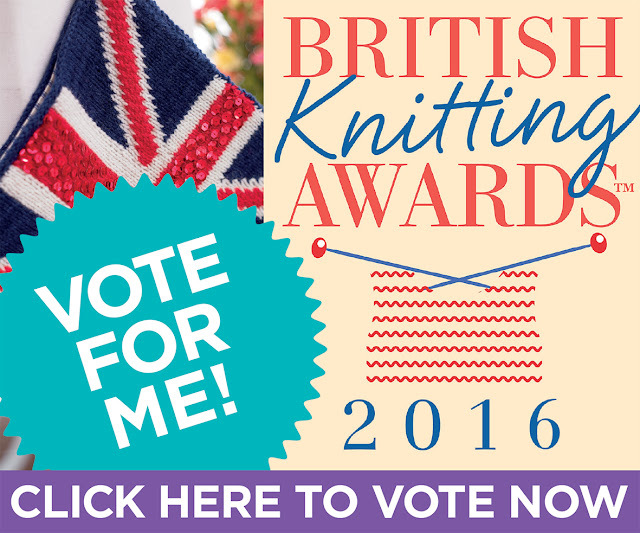 If you would like to vote for me in the Favourite Book (2015) and Favourite Knitting Blog categories (and I would love it if you would! ), then you just need to follow this link: www.letsknit.co.uk/britishknittingawards and click on your choices. 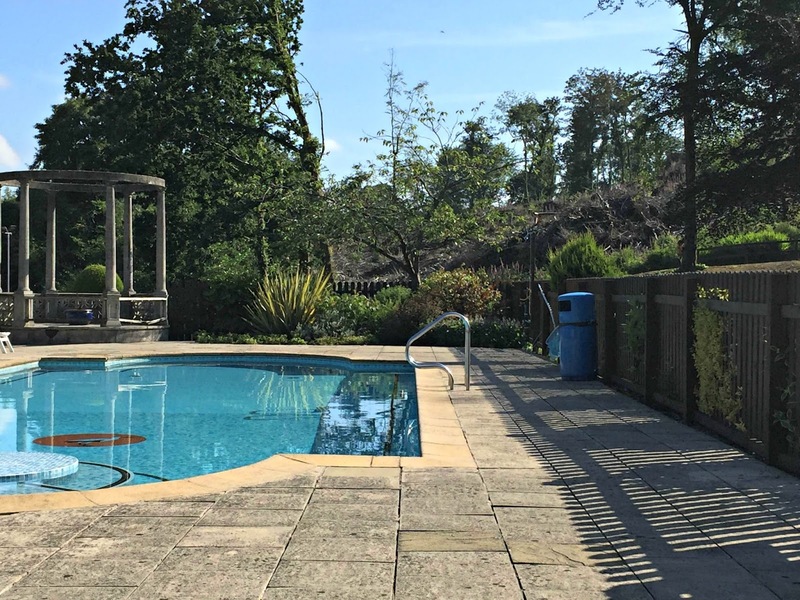 There's the chance to win a spa break too, which is always very nice! I mentioned the other day that I had cast on a very special pair of socks, and I'm going to tell you all about them today. Don't worry, I haven't forgotten about the DK socks that I'm writing the tutorial for, but these socks have a deadline and it's not far away! These special socks have got a very particular job to do - and that is, to look after big daughter's feet whilst she's away in Peru. She's got a very strict kit list and is only allowed to take 4-5 pairs of socks for the whole month that she's away. (I did wonder if the whole kit list was some kind of revenge by parents of teenagers who like to have several outfit changes a day J) You can imagine how pleased I was when she asked if some of those socks could be hand knits! Oh - but the responsibility! What if they wear through? 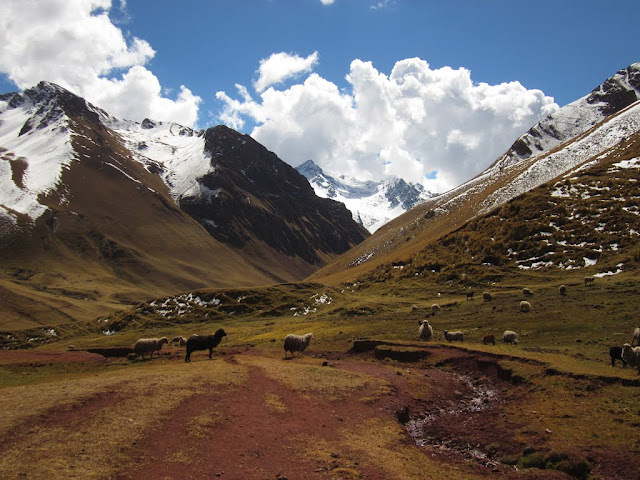 I can't see her darning her socks up in the Andes. What if they're not comfortable? Should I bottle out and just buy more pairs of commercial walking socks for her? What if she can't wash them properly? I took a deep breath and sat down at the computer to do a bit of research. I thought about all the pairs of socks that I've made and all the yarns that I've used. They've all been sock yarns with a nylon content to make them hard-wearing, and I could probably have used any of them in pretty much any weight (I've been surprised by how thin manufactured walking socks are these days) but I still wasn't quite sure. 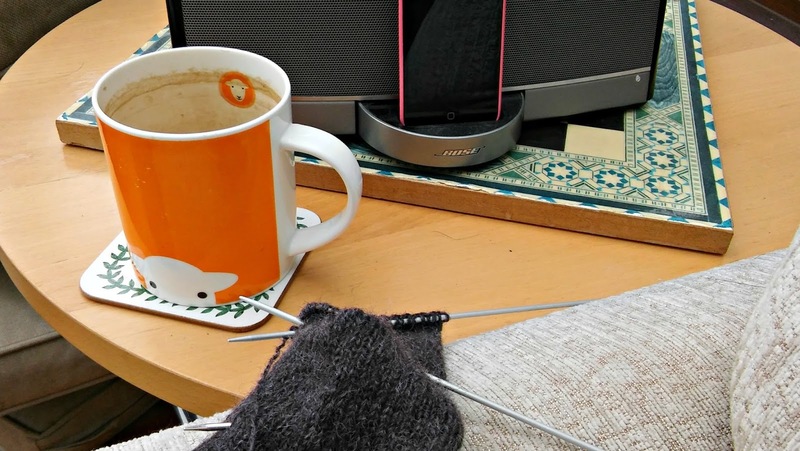 I had previously read this article about sock yarns that didn't require any nylon because of the fibres used and although this may not have been the time to try out a new yarn, I wanted to know more. Cue more Googling. By the time I'd finished, I was pretty much set on using one of the yarns from the Blacker Yarns range which I've looked at several times in the past. Blacker Yarns was started in 2008 by Sue Blacker, who owns the Natural Fibre Company spinning mill. Their speciality is spinning high quality yarns from British fleece (because of the damp UK weather, their Merino comes from the Falkland Islands but whatever your political leanings, the islands are still part of the UK), and especially from rare breeds sheep and their ethical values tick the boxes for me - supporting the farmers by paying a fair price for the fleece, supporting high standards of animal welfare, and being concerned about the environment. 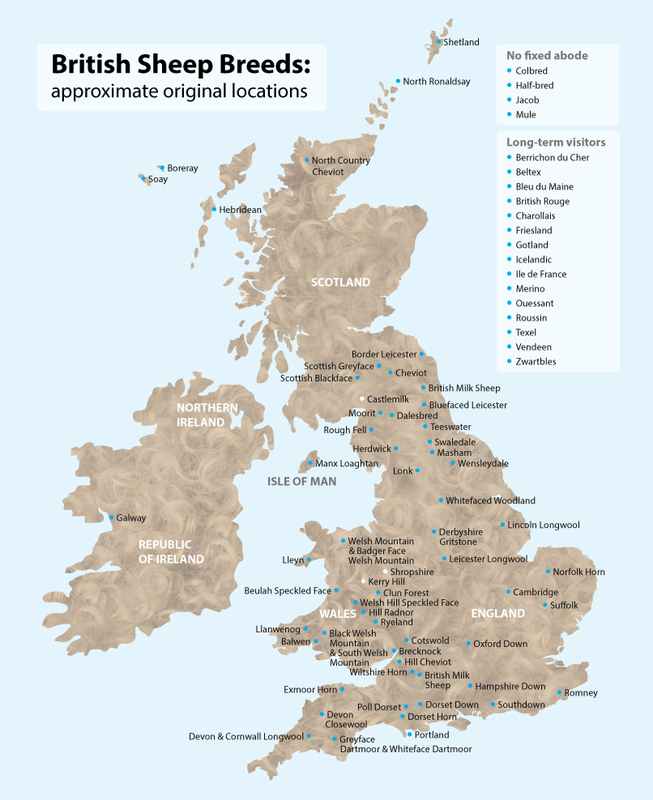 You can see from this picture taken from their website just how many British breeds there are! It seemed very important to me that big daughter should take something away with her that was rooted in the place she calls home, and this yarn seemed to fit the bill. But before I bought any, I still had to make sure that I was making the right decision. Sonja at Blacker Yarns was full of knowledge and patience when I phoned to ask some questions, spending a long time talking to me about the yarns that they had which would make perfect Peru socks. I needed something that would be strong and hard-wearing but still soft enough for big daughter to want to wear them every day and, of course, I wanted to know how this was possible without nylon. Sonja explained how the nylon is only needed if the fibre is very soft - think merino, cashmere, alpaca, silk - and that wool fibres come in different lengths which is how they are able to avoid using nylon. The longer the fibre length, the stronger the yarn becomes. Their new Tamar yarn uses Wensleydale fibre which is 2" long and produces a good strong yarn ideal for socks. I've been admiring this yarn since it was launched earlier this year, and I know that I will be making a pair of socks with it at some point - but not just yet. Instead, this is the parcel that arrived the other day, along with some shade cards which Sonja very kindly sent me so that I could see their other yarns which would be suitable for socks - Blacker Classic (at the top) and Tamar - the colours have me wanting to start some now but I have other socks to knit first! For big daughter's socks, I chose a different yarn. This is what was inside the parcel. and that blending their chocolate brown fleece with mohair (apparently known as "nature's nylon") makes it very easy to dye. The balls that I've bought are purple, although it's not the bright Cadbury's purple that I think big daughter was expecting. This is much more subtle, like blackberries, which actually feels much more appropriate. I now know that the reason why the sock is coming out bigger is that it knits up more like a sport weight or 5ply yarn. Sock yarn generally tends to be sold as 4ply or 6ply (or 8ply) and this is definitely more like a 6ply but not quite. I'm knitting on my usual 2.5mm needles and 48 stitches is fitting very nicely on my 30cm circular - there's no way that would happen with regular 4ply. It's coming on very nicely now, and of course with being thicker yarn it's knitting up pretty quickly. I'm hoping to get two pairs out of my three 50g balls. The other reason why the sock is a bit bigger is that it's not been superwash treated, which means that the yarn has more stretch to it. Superwash yarn has been through a chemical process which makes it safe to be washed in a machine - it's something that I've been very grateful for as I don't often handwash my socks. There have been times when I've had to rescue them from the dryer as well and have been very relieved to see that they're still my size and not shrunk to something I'd have to leave out as a gift for the tooth fairy! I'd never really given much thought to the idea of superwash at all, really, but after Sonja telling me specifically that they never superwash their yarn, I thought I'd better find out some more about it. This article explains it very well, but in a nutshell, wool fibre is very much like human hair in that it has scales along the length. This is what will make it felt in a hot wash, and the superwash treatment stops that. There are two ways of doing it - either the yarn is coated with plastic which smoothes the scales or it's blasted with chlorine gas which burns them off. Neither of them sound particularly attractive, but there's no getting away from the fact that superwash yarn is a very useful product to have around and quite probably I will use it again in the future because it fits in with modern living (and washing machines) - and the fact that superwash allows the yarn to take up brightly coloured dyes very easily and I do love rainbow socks! I guess it's always good to be able make an informed choice, though. You can see from this picture that the fabric is quite woolly (it's a 50% woollen, 50% worsted yarn which means that it's semi-smooth - you can read more about it here) but I like that (and luckily, big daughter does too). These feel like very sturdy socks and I feel much more closely connected to the sheep and the yarn when I'm knitting them. Does that sound daft? Maybe you need to knit some too and see if you feel the same! I'm using my basic 4ply sock pattern (although the stitch count makes it more like the 6ply boot sock pattern) but I'm continuing the heel stitch underneath the foot and along the sole to make it thicker. It's easy enough to do, and I'll show you how to do it in case you ever want to give it a go for yourself (remind me, I'll do that in another post, and perhaps with a different yarn so that it's easier to see). You don't usually put stitch markers at the side of the heel in case you're wondering what I'm doing - I'm just using those to show me where my heel is whilst I'm working the extra heel stitch as it's easy to forget! I've got just about 4 weeks now to make these two pairs of socks, but I think I should do it. I'll be keeping you posted of course! Finally, in case like me you're interested in how the construction of yarn and why you might choose to blend particular wools together, Sonja recommended this book as a good place to start. It arrived yesterday and I had to abandon all else to sit down and take a quick look at it. It's a very beautiful book, I have to say, full of gorgeous pictures and packed full of information about pretty much every breed of animal you can spin yarn from (including cats and dogs - ha!). 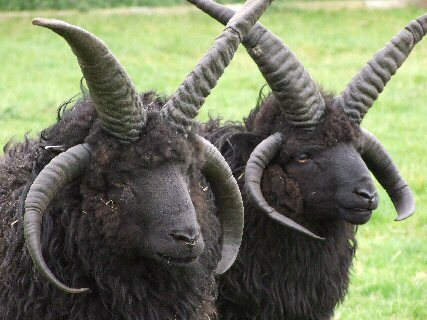 Here's the page on Hebridean sheep - it says that the fleece is ideally suited for socks, which is just perfect for me. It's naturally anti-bacterial too, which will be just perfect for big daughter if she doesn't get to wash them that often. In fact, pure wool items don't actually need washing that often - just giving them a chance to air is enough - but I guess if it gets to the point where they're walking off up the mountains without her then she might need to! Did I mention then gorgeous pictures? I had to put it away otherwise I'd have wanted to spend a long time looking at it and there are other jobs to be done. 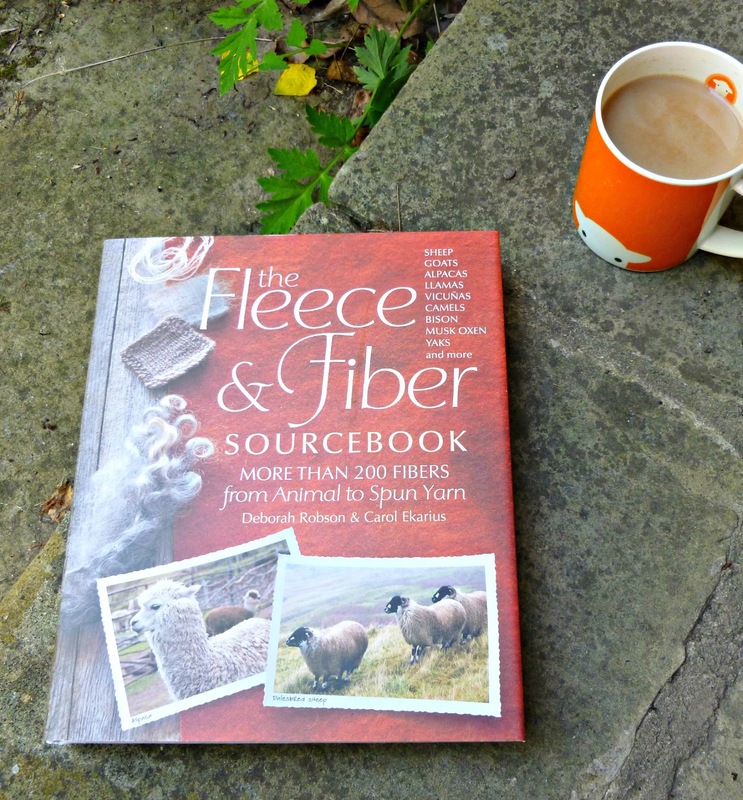 It's written in a very accessible way, even for someone like me who doesn't have the first clue about things like crimp and staple lengths, and has lots of sections on facts about sheep and yarn in general which are interesting to read.